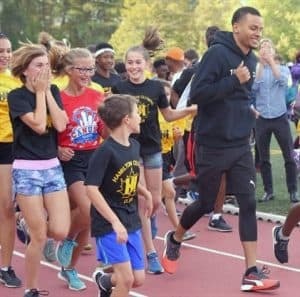 The Andre De Grasse Family Foundation (ADGFF) is a public charitable foundation committed to empowering and inspiring youth through sport and education. Andre’s namesake foundation seeks to inspire youth to reach their own unique potential by providing them with similar opportunities that made Andre a champion in sport and in life. The ADGFF will expand its impact over the coming years by teaming up with other organizations that provide mentorship and/or resources to youth across Canada. The Foundation’s vision reflects Andre’s mantra, to Speak It Into Existence. All Ontario high school track and field athletes who are not yet training with a track and field club, are invited to apply for funding support by clicking the button at the bottom of the page and filling out the online form. All costs associated with Athletics Canada membership, club registration, meet entry, uniforms, equipment, accommodation and travel. Full-time coaching or coach mentorship support by two-time Athletics Canada Development Coach of the Year, Tony Sharpe. Strength training program designed and delivered by former Detroit Red Wing and Toronto Maple Leaf strength and conditioning coach, Peter Renzetti. Chiropractic care by Dr. Alban Merepeza, Andre’s personal practitioner. Academic consultation and ongoing support from student-athlete consultant, Barb Boyes. Rounding out the program, Coach Tony and Andre will develop and deliver a series of track and field clinics for promising athletes and coaches. The Andre De Grasse Family Foundation will expand its impact over the coming years by teaming up with other organizations that provide mentorship and/or resources to youth across Canada. The Foundation’s vision reflects Andre’s mantra, to Speak It Into Existence. The Andre DeGrasse Future Champions Fund (ADGFCF) is a joint initiative of the Athletics Canada Foundation and the Andre De Grasse Family Foundation. In addition to his achievements on the track, Andre is a university graduate of University of Southern California (USC) and has a deep appreciation of how mentors, training and education helped his success. The ADGFCF aims to empower youth to use competitive sport as a platform to further their academic potential and become healthy and productive citizens in their community. The ADGFF will use the same blueprint that propelled Andre into a champion, and provide the support and services required for high school athletes to maximize their athletic ability in pursuit of academic success and the opportunity to realize their potential.